Left 4 Dead proved such a game changer for online co-op gaming, it wasn’t much of a surprise to see multiple games looking to jump in on that same formula to try and deliver an equally thrilling experience. One such game that garnered much interest for its efforts though was 2016’s Warhammer: End Times – Vermintide. 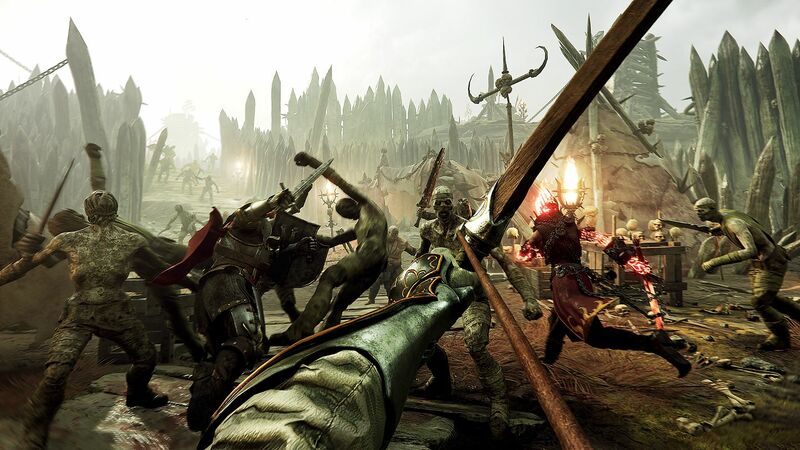 Vermintide provided players with the same fast-paced gameplay whilst Warhammer’s iconic enemies flooded in. It was certainly a refreshing Warhammer experience, but it wasn’t without issues. That was two years ago though, and with the sequel now upon us, can Warhammer: Vermintide 2 provide the ultimate co-op gaming experience? The story takes place not long after the events of the first game in which our band of heroes were captured by Grey Seer Rasknitt. Since that vital victory, Rasknitt has since conquered and taken command of the city of Ubersreik. With no delay in his actions, he now awaits the erection of the giant portal known as the Skittergate, however a failed test of the gate causes a large amount of destruction to the nearby prison cells and Markus Kruber, one of our main protagonists, is freed. After rescuing the others that are locked away in the confines of their cells, it’s time to seek revenge against the mighty Rasknitt. From this point on, any further story telling is whittled down to additional information via the various loading screens and the meaningful conversations had between our band of heroes during each level. This seems to be common practice for co-op adventures, and it certainly helps bring a focus to the gameplay itself. In terms of gameplay, Vermintide 2 provides a rather brilliant experience. There are four different acts for players to play through, with 13 missions spread throughout. It helps massively that each and every one of them is incredibly detailed, well designed and a thorough joy to play. Before the start of each mission, players can choose to either go it alone with A.I bots controlling the rest of the team, or up to 4 players can come together to head into the mission as a fearsome team. This is done within the abandoned area that the band of heroes have decided to settle down in, and here players can choose the mission they want to play and what difficulty to play it on, as well as opening any reward crates earnt from the completion of missions and challenges. It is also here that you will get to choose the character to go into battle with, customising their appearance and arsenal from items unlocked, while also crafting or salvaging items with the forge and keeping track of the various gameplay challenges on offer in OKRI’s Challenges board. There’s plenty to dabble with here, but once you’ve figured out what’s what and where exactly everything is, you’ll soon be keen to whisk your way over to the mission board and get going. Each level plays out very much like the aforementioned Left 4 Dead, and contains unique objectives; players are usually required to hold off a horde of enemies whilst completing a particular objective, with the end of each level resulting in either a boss battle or a lengthy survival event before everyone escapes together. Along the way there are various enemy types to watch out for, with one in particular – the Bile Troll – causing considerable difficulty when playing on anything other than the Recruit difficulty level. 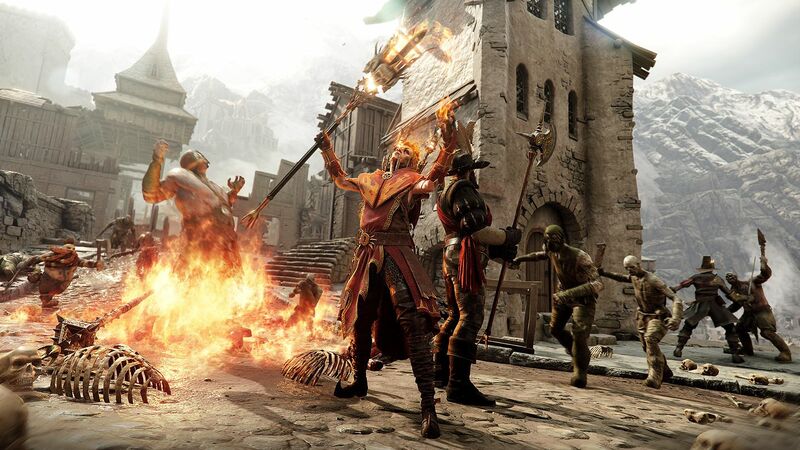 Whilst we’ve already seen multiple games provide this kind of experience, it’s fair to say Vermintide 2 is no slack when it comes to keeping things enjoyable and that’s got a lot to do with just how satisfying the combat feels. As with the original, combat comes down to mostly hacking and slashing, with a few long ranged weapons such as bows, crossbows and some firearms mixed in alongside the occasional thrown bomb. But whilst I was disturbingly enjoyable sending an arrow straight into the head of the oncoming Skaven and Chaos hordes on numerous occasions, it was the satisfying swing of the mighty mallet unlocked from one of the reward crates that really delivered the enjoyment of the combat. With every weighted swing that met the body of an unsuspecting enemy and the sweet thud it gave as I thumped them around the head, I found the combat rarely failing to impress, especially in the midst of being overrun by swarms of enemies. The other reason Vermintide 2 is so damn brilliant is down to just how stunning everything looks. No matter what it is you cast your eyes upon, be it the countless enemies, the luscious scenery, or even the heroes themselves, everything is showcased in incredible detail. It gets better when you take into account the fantastic musical score that accompanies things; it certainly sticks in your head long after putting the controller down. Unfortunately, if it were some fresh faces you were looking forward to with the sequel, you may be disappointed as the same five characters we had from the original are once more the crew at hand; Bardin Goreksson the Dwarven Ranger, Victor Saltzpyre the Witch Hunter Captain, and Sienna Fuegonasus the Battle Wizard all return alongside Mercenary Markus Kruber and Waystalker Kerillian. Spend a little time with each character however and you’ll eventually unlock their second and third classes, known as ‘Careers’. These are very much like unlocking an entirely new character as they come with a new Passive Ability and Career Skill which effectively has a role in defining how you play. These Careers are unique to each character, and the final unlock for Kerillian which brings the skill of being able to pass through enemies completely undetected for 10 seconds, or at least until it is time to attack, is utterly brilliant. On top of the new skill, each Career also brings one or two completely different perks to enjoy and with a new arsenal of weapons each time, as well as a new title, this is certainly something that will add to the longevity of the game. The new Careers for each character are unlocked at Level 7 and Level 12 respectively, but it will take a fair bit of time if you hope to unlock every class for every character as levelling isn’t the quickest process. You’ll soon find yourself needing to repeat missions to unlock everything. The Careers are a big new feature to Vermintide 2, but another is the previously mentioned Chaos race of enemies that now terrorise. It’s fair to say that both new features are welcome additions as thanks to them things remain fresh at all times – both with character selection and in combat. Something that was lacking with the original. After you’ve completed each level though and the onslaught of enemies has finally chilled, it’s back to the quiet confines of the abandoned settlement and here players can either relax or prepare themselves for the next battle. It’s also here that the rewards I mentioned earlier are unlocked. 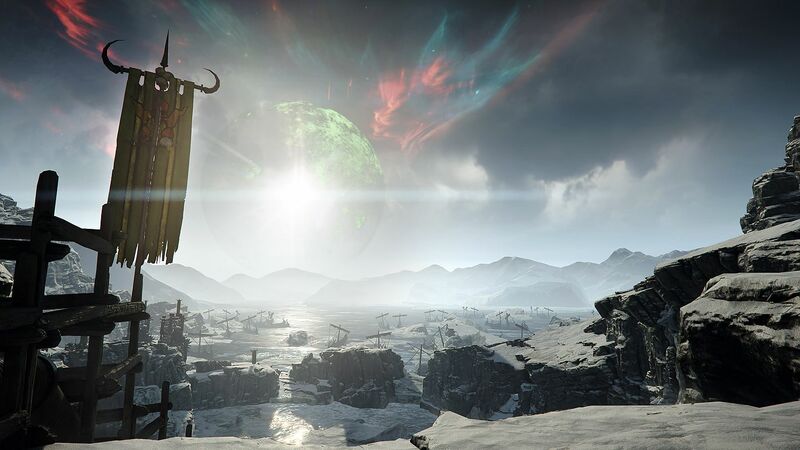 Unlike the first game, Vermintide 2 is certainly much more giving with the rewards and it doesn’t take long before you start finding rare loot coming your way, provided you’ve completed the level you were playing that is. With so many items awarded to the player through mission completion and crates unlocked through completed challenges though, it doesn’t take long for a steady build up of unused gear to accrue. This is when the Forge comes into play as players can use this to Salvage materials from unused items that can then be crafted into a new item for use later on. For those wanting to build towards the ultimate loadout, the opportunity is readily available. It’s fair to say there is very little to complain about in regards Warhammer: Vermintide 2. There is however one niggle and it involves the online side of the action. See, jumping into missions online and wanting to play as a specific character is sometimes a problem and ideally you need to host the game as if someone already has your character, you’ll be forced to use someone else. Of course this isn’t a big deal, but if you’ve just spent the last hour perfecting your class only to find yourself switching to a completely different role when things get going, it can be a little frustrating. Overall though, and whilst the Vermintide series got off to a steady start, Vermintide 2 improves on its predecessor in almost every way. From gameplay to visuals, and sounds to controls, everything is smooth and fluid. 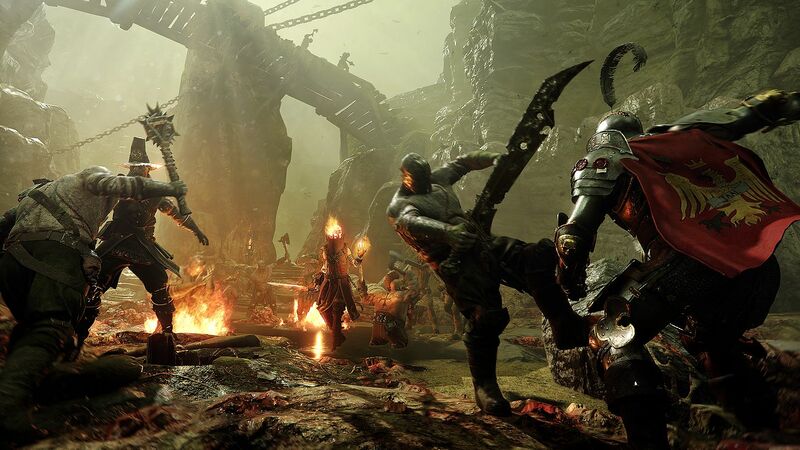 Allowing for plenty of variation and depth to each character, as well as an entirely new race of enemies alongside the already freakish Skaven, and Vermintide 2 has all the boxes ticked when it comes to a sequel done right.